Monday is ‘bun shop day’. It’s been that way for the last six years. Every Monday I pick the big kids up from school and we run to the ‘bun shop’, aka our local bakery, and grab a quick treat to eat as we rush off to dancing. Our ‘bun shop’ makes the best apple scrolls. They are huge, and soft, and fluffy, and appley, and cinnamoney, and delicious. 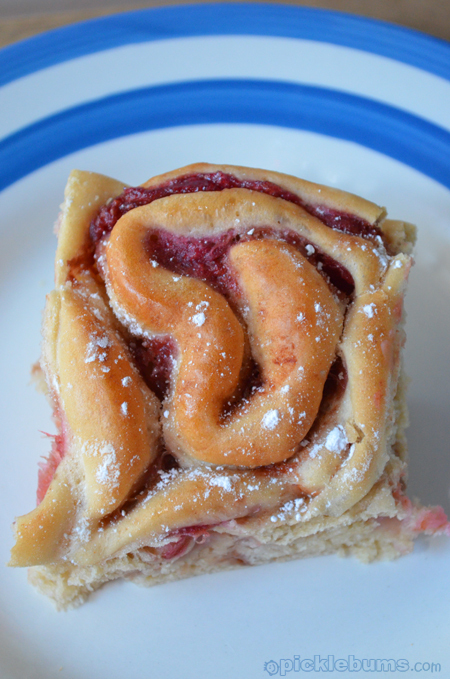 My homemade scrolls are not the same, but warm from the oven, and full of pretty pink rhubarb as well as apple they are pretty darn great and almost make up for a missed ‘bun shop Monday’… almost. I first started making these scrolls and shared them on my blog back in 2012 when I was on a ‘make it from scratch’ mission. I still like to make lots of things from scratch, and these apple and rhubarb scrolls have become a highly requested treat in our house. There are a few steps to this recipe, and you’ll need to plan ahead a little, but don’t let that put you off, these homemade scrolls are worth the effort! As with all of my homemade bread recipes, I ‘cheat’ and use a bread machine to mix, knead and rise my dough for the first time. It is so easy to just dump all the ingredients in the bread maker, set it to ‘dough’ and come back when it beeps a few hours later. It also means that know the dough has been kneaded well, and had a good first rise which is sometimes tricky in our old drafty house in cooler weather. Of course you can also make the dough by hand, or use a stand mixer for the kneading, that works just as well. Cook up your apple and rhubarb filling while you dough is rising. You can do it in a saucepan on the stove, or in the microwave. Sweeten the tart rhubarb with some honey or sugar, or leave it as is if you have sweet apples or if like a little more bite to your scrolls. Once the dough has risen for the first time, give it a quick knead to knock all the air out of it, then roll it into a big rectangle. Spread the rhubarb and apple mixture over the dough as evenly as you can manage, going right up to the edges, then sprinkle it with lots and lots of cinnamon sugar, or not so much if you prefer. 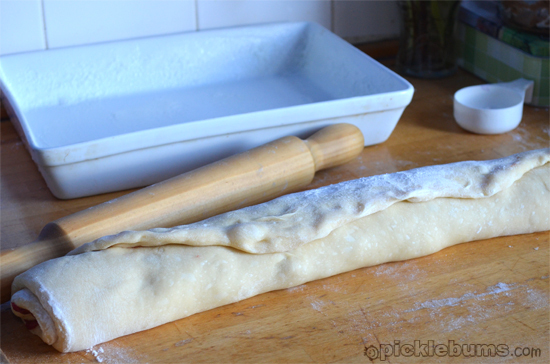 Carefully roll up your dough starting at the long edge of your rectangle, to make a big sausage. Cut it into 10-12 pieces and plonk your cut scrolls into a nice big, well greased dish, (we use a lasagna dish) with little space between each one. Cover the dish with a damp tea towel and pop them in a warm place to rise. It should take about an hour in a warm spot. The scrolls should pretty much double in size and fill up all the empty space in your dish. Now into the oven! They should take around 25-30 minutes to cook. If they are still a little doughy in the middle, turn the oven off but leave the scrolls in for another 5-10 minutes. You’ll have to let them cool at least a little bit or they’ll be impossible to get out of the pan, but eat them while they are still warm! 1 tbsp of instant (dry) yeast. 1 1/4 cups of warm water. Combine the yeast and honey with the warm water, and set it aside till it forms small bubbles. Add the oil to the yeast and honey mix then add it to the the flour and combine till it forms a rough dough. Add a little more water if necessary. Use your bread machine to mix, knead and rise of the dough, or mix and knead with a stand mixer using a dough hook, or by hand. While the dough is rising make the rhubarb and apple mix. 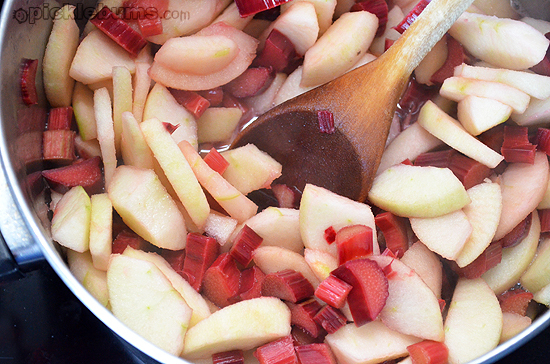 Wash and chop the rhubarb into small pieces and place in a saucepan or microwave safe container. Peel and slice the apples and add them to the rhubarb. Add 1/2 a cup of water and 1/2 of sugar or honey – more or less depending on how tart you like your rhubarb – and mix well. Cook over a medium heat or in the microwave until the rhubarb is soft. Grease a large, high sided dish or tray and line with baking paper. Knead the dough a little to knock the air out of it, then, on a well floured surface, roll it out into a large rectangle. 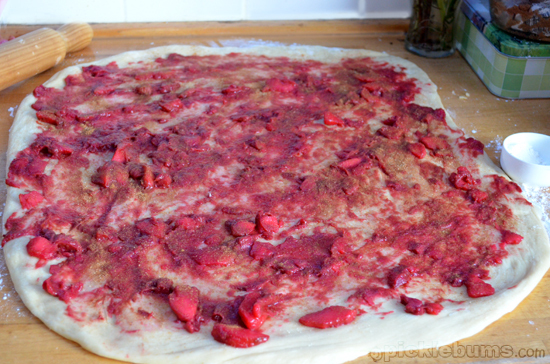 Spread the apple and rhubarb mix over the dough, all the way to edges, and sprinkle with cinnamon sugar. Starting at the long side of the rectangle, roll the dough with the filling inside, to form a long sausage. Slice the dough into 10-12 scrolls and place them into the dish with a little space between each one. Cover the dish with a damp tea towel and set it aside in a warm place to rise a second time. When the scrolls have risen and doubled in size (approximately 45 minutes) preheat your oven to 180 degrees Celsius and bake the scrolls for 25-30 minutes. If the scrolls are not quite cooked in the middle, turn the oven off and leave the scrolls in for another 5-10 minutes. Dust with icing sugar or glaze. You can ice your scrolls if you like, a cream cheese glaze is divine, but that takes time and you really do need to eat these while they are still warm. Just sprinkle them with icing sugar or eat them plain! Do you have a weekly tradition? 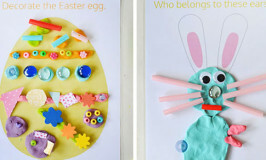 Something that you always, always, do with your kids? These looks soooo yummy. I’m a big rhubarb & apple fan. 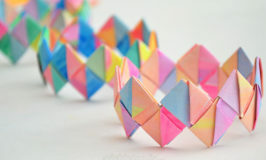 AND a scroll fan – so these are right up my alley. I love the bakery in your town too – we always find an excuse to stop there for pies. I will try their scrolls next time too! They look great, what a lovely kinder/school snack. I am foing to add these to my baking list. Thanks Kate. I still have loads of spinach in my garden so I think I will try a savoury version. my kids eat the stewed rhubarb and apple for breakfast, or take it to school for fruit snack. Thankfully we grow a LOT of rhubarb, now if only our apple trees did as well! I adore rhubarb and these look great….perfect morning tea treat. oh my you are clever! will have to try this one out! fantastic morning tea recipe and I do love rhubarb! I just called my husband and told him he has to get my oven fixed this week, I want to bake! And I’ll be planting rhubarb, as soon as I figure out if it will grow in qld. Oh yum. What a brilliant idea. We will definitely try these – my kids love rhubarb and apple crumbles, and your fruit scrolls look delicious! 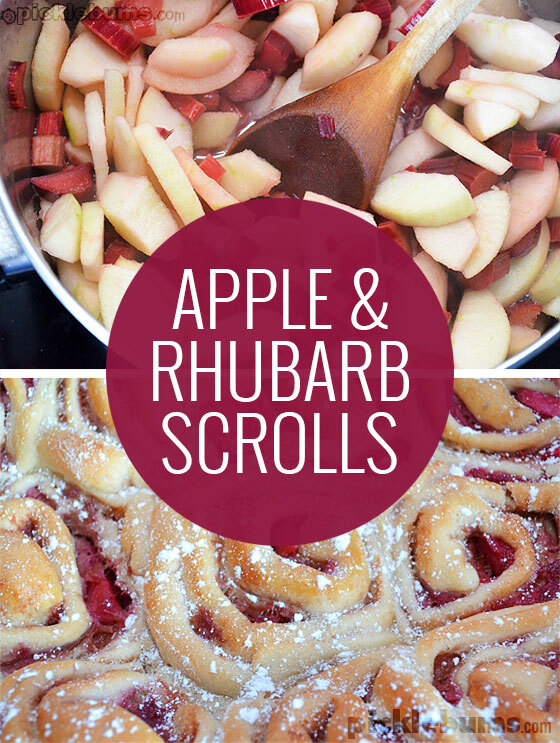 Home » Rhubarb and Apple Scrolls.